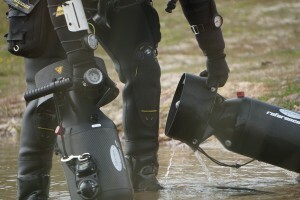 Discovered in the east of germany: The Geiseltalsee – a paradise for DPV-Diving! This lake is large, you could say huge –a surface area of 18 qkm offers a lot of space for waterfowls, water sportsmen and natural spectacles of a particular kind. 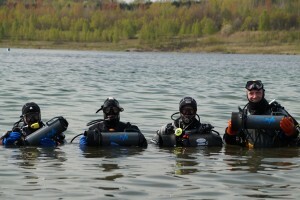 Despite the considerable size of the lake, it is relatively unknown also in diving circles. Until autumn 2015, even myself I had no idea at all that it exists. Instead going to dance into May, we started out from 29.04. – 01.05.2016 for a little exploration to Mücheln in Saxony-Anhalt. 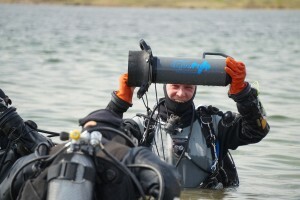 At the largest artificial lake in Germany, Heiko Günzel operates his dive centre and invited to a Bonex scooter event. The dive centre celebrated its two years anniversary, which we wanted to celebrate and support with our Bonex DPVs. 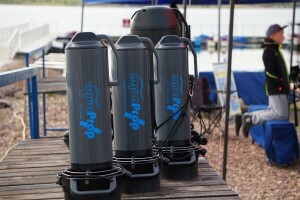 The numerous AquaProp testers and enthusiastic Bonex fans rocked the lake! We are sure that scooter divers write the future of this young lake. Our UW vehicles are there not only permitted there, but also a must! The lake is huge and pure adventure. If you would like to see all of it, a motorized Bonex-Dive is inevitable. We had fantastic visibility and were assured that it is always like that. Filtering mussels in the treetops of the submerged forests and remnants of brown coal in the former GDR opencast mining ensure a brilliant view of 10-25 m, always!